Dear blog readers, At some point, our conversation around Julian of Norwich’s Showings may come to an end. And at some point again, we might just turn it into a series of posts. For now, I do hope you will read the latest from my co-blogger Theophrastus: “What might have been: Edwin Drood, Bruckner’s Ninth, Nabokov’s Laura, Wallace’s Pale King” Ellison’s Three Days, and the ‘uncensored’ Julian of Norwich.” As you’ll see, he there very clearly shows the problems of the very and perhaps too-late “efforts to complete works left incomplete by an author or composer’s death.” David Foster Wallace could not, and perhaps should not, have been awarded the 2012 Pulitzer Prize for Fiction for his posthumously completed novel The Pale King. Theophrastus, as his post’s title suggests, deals with many more cases than just Wallace’s. He explains and shows how “various surviving manuscripts can be considered as partial notes on [a late editor’s] hypothetical super-text.” And Theophrastus persuades me that “works edited from incomplete authorial notes,” really, in general, must be “considered inferior to the author’s completed works.” I think his post will convince you as well. What Theophrastus does very well is to test whether there is a real difference between what Bible translators and editors do with the Hebrew (and Septuagint, and if you like with the New Testament even, I’ll add) and what Julia Holloway has done with her composite translation of the manuscripts of Julian of Norwich. I’m still considering the points he’s made. And yet I do want to show two cases that we might compare with Holloway’s. First, notice what Robert Alter does with Genesis 49:26-27. And notice what the KJV team of translators, the ESV team of translators, and the RSV team of translators respectively do with the same. If you have Alter’s Five Books of Moses, then also look at the entire footnote he makes there (which begins this way: “The Masoretic Text is not really intelligible at this point, and this English version [of mine] follows the Septuagint for the first part of the verse”). Notice how both Alter and the RSV team choose to follow the Septuagint. The ESV team follows the KJV here (although they do offer a variant translation in a footnote, one that acknowledges the reading of the Greek translation of the Hebrew Bible presumably before or somehow an explanation of the MT). Carson does not, in the end, startle her audience with inventions either. She’s not conjecturing “What might have been.” She is doing what Alter and the RSV team do, as they show what “Moses” writing must have said (considering the late manuscripts clearly not all his own, even if these Hellene texts were crafted back in Egypt where Moses learned his languages, his abilities to translate, and so forth). 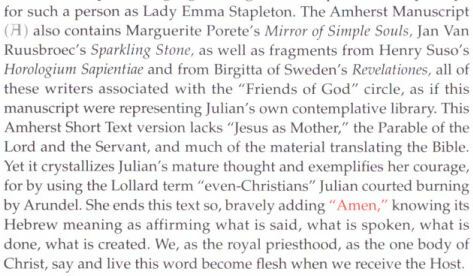 And Carson, like Alter and the RSV team, bring the late written texts into a composite with the earlier, in the English translations. Why do modern Bibles clearly contradict within their own texts? Is the KJV the best? It seems you may have confused the intentions of this blog post with other concerns. 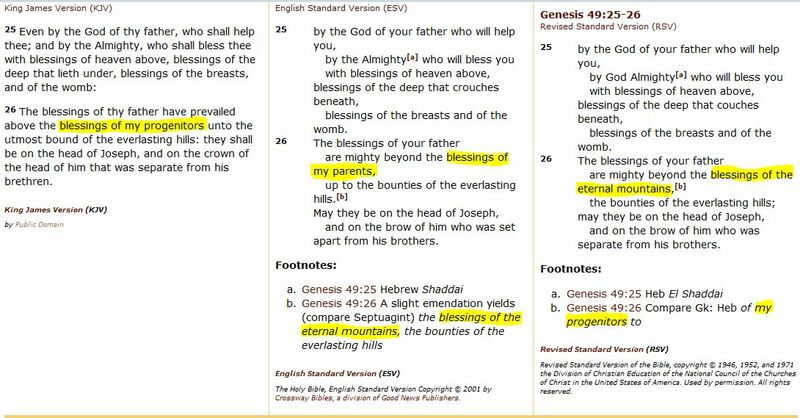 Would you care to comment on how the KJV translation of Genesis 49:26 (with its phrase “of my progenitors”) might be the best? All arguments agains what is true are answerable, surely. Bring forth your strong reasons. …. Thanks. Happy to engage in a conversation, but do know that I’ve removed your “should listen to” link and your “nut” comment from what you just posted. For all who care to follow whatever agenda you might want to push with the KJV, they can just figure that out some other way, I’m sure. Can I say ‘Thank you’. Our edition and my composite translation of Julian were scathingly reviewed, mostly because they present a paradigm shift in dating the texts in the opposite order (from internal and contextual clues) than commonly received opinion. It is heart-warming finding them being studied and appreciated, rather than derided and censored. We appreciate very much your reading the various posts here, and I hope you have seen that at least one of our readers is considering now teaching Julian of Norwich using your wonderful translation. I hope we, in our differences even here over your intentions, have shown fairly what you intended and accomplished with your works. I do believe you’ve shown us Julian of Norwich’s Showings in new light! Thank you. Also, we’re grateful that you’ve decided to hold the international symposium and are glad you can announce that here.